First registration: April 9, 6:49. 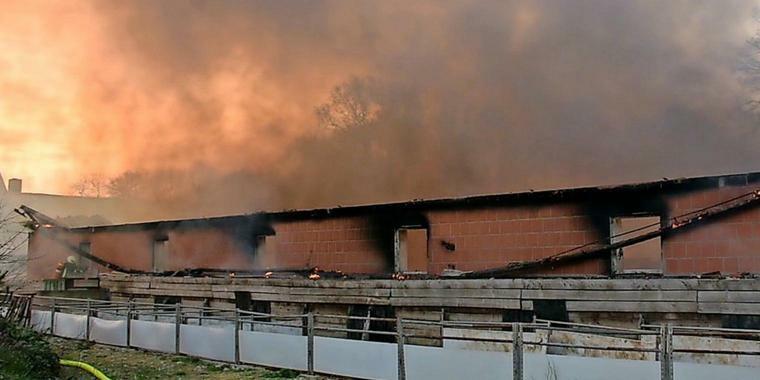 Warendorf – Around 19:19 on Monday (April 8), a pigsty of the farm Schwienhorst (Warendorf, North Rhine-Westphalia area) has caught fire. Whether this is a technical defect or even arson has not yet been determined: the cause is not yet clear. Around 130 firefighters were on duty and were able to prevent the fire from spreading to the nearby residential building. However, the pigsty burnt down completely in Warendorf: “It killed about 100 mother sows (!!!) and 1000 piglets,” reports the police. 500,000 Euros damage after fire in Warendorf !! It is not the first fire in the Münsterland where animals had to die: just a few days ago a pig stall was in flames in Ostbevern. It killed 100 animals. ( Due to this fire, PETA has filed complaint against the operator, note from Venus). The owner of the plant has now been shown. That could now be imminent for the operator of the pig farm in Warendorf. We are deeply saddened by the death of 100 mothers who were burned as slaves in a barracks for the purpose of meat production. We mourn over their 1000 newborn children, who were also born as slaves in the service of the meat machine and were burnt together with their mothers helpless and cruel. They were not mother sows, they were mothers. They were not piglets, it was their children. This is how the language of the media works: they present the mass murder of animals as ordinary random events and degrade the victims to objects, so that the perpetrators are relieved in advance. And if one still does not feel compassion for the “poor” farmer, who is financially ruined by the “unexplained“ burning of 1000 creatures, the amount of 500,000 euros in damage will convince him. Mass media reports about animals are Conscience Opium for naive people.